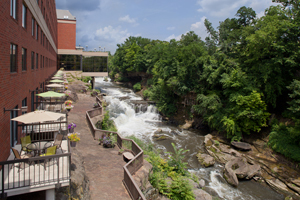 As you awaken to the calm rippling of the Cuyahoga's waters and natural beauty, it is hard to believe that Sheraton Suites Akron/Cuyahoga Falls is located only minutes away from northeast Ohio's most popular leisure and business attractions. We are the area's most established full-service hotel, offering all-suite rooms, intimate dining options and supurb comfort and hospitality. That is the beauty of Sheraton Suites Akron/Cuyahoga Falls. 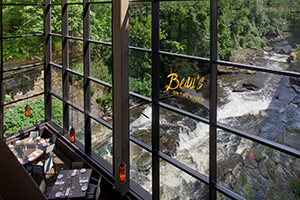 With three walls of windows overlooking the cascading falls and gorge of the Cuyahoga River, you have arrived at a special place when you enter Beau's on the River Restaurant & Lounge. 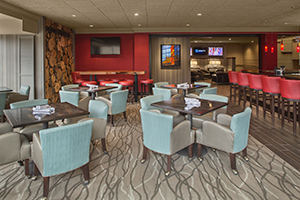 Beau's on the River embodies the creations of Executive Chef Billy Thurman and is located within the luxurious Sheraton Suites Akron/Cuyahoga Falls. Beau's on the River couples a dramatic view of the Crooked River with expertly prepared classic cuisine with a twist featuring a range of flavors and styles. Additionally, Beau's on the River is open daily offering scrumptious breakfasts, lunches and Sunday Brunch menus. Our hotel is unique in Akron and Cuyahoga Falls in that our rooms aren't just rooms, they are full suites. 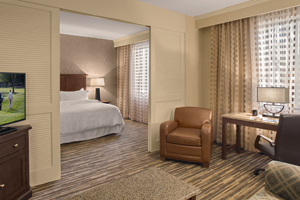 Along with our traditional suites, we offer upgraded Whirlpool suites, Penthouse suites and VIP King Multi-level suites with internal stairways and walkout balconies right over the rushing waters of the Cuyahoga River. These suites include separate sleeping and living quarters, wet bar and kitchen with china, glass, silverware and refrigerator. Our bedrooms and bathrooms, some with whirlpools offer the top in luxury. I can't thank you, Raya and your staff enough for all of your hard work and dedication. The reception was spectacular and every detail was perfect. I have had so many compliments on the wedding and the food you would be amazed. I wish I could take credit for it but the credit belongs to you and your staff. Thank you again. We just wanted to say how amazing everything was on Saturday and how impressed we were with the Sheraton and the staff! The servers were awesome and there was hardly ever a line at the bars which is exactly what we were hoping for! I didn't get her name but one of the front desk girls even helped me look through the trash the next day to try and find a charm that was very important to me (which turns out my sister had the whole time). The room looked amazing and we could not have been happier with our night! Thank you so much for all of your help and for putting up with me as practically a zombie at all our meetings. We honestly could not have asked for a more perfect wedding day! The Sheraton and all of the staff did an absolutely perfect job. On Monday, we were talking about how perfect our day went and how nothing went wrong. Thank you so much again! Everything was amazing and couldn't have gone better! We knew things would be great, and somehow they even exceeded our expectations! The whole night, from the cocktail hour through dinner and the reception was great. Every one of the staff went above and beyond to make things amazing. We received nothing but great compliments from our guests on the whole night. Thank you also much for making it everything we could've hoped for! I also wanted to thank you from the bottom of my heart for all the hard work you put into our wedding. My mom was so incredibly impressed with your organization and ease of keeping us all calm the day of. Both you and Raia were tremendous support to all of us the entire weekend and we could not have had the perfect day we had without you and the staff at the Sheraton. We are so grateful, thank you so much for making our wedding one of the best our guests had ever been to! Thank you so very much for all of your help in planning our rehearsal dinner! Every time we connected you were lovely and professional! The evening was wonderful and the food delicious. Nancy and Karen were our two servers and they were so helpful, accommodating and kind! Please tell them we so appreciated their time and effort and attention to detail! My family that stayed at the hotel were more than satisfied with their rooms and service. They had an enjoyable stay! The Sheraton will go highly recommended! God Bless you and your new husband! I hope life brings you much happiness and many blessings! Enjoy each other- have fun!